​Virtually all shell characteristics of this species are variable, including colour, thickness, texture, banding and sculpture, making identification somewhat tricky. Shell colour can be uniformly grey, white, pale brown, orange or even purple and may have coloured bands. In exposed areas, shells may be smooth, while in more sheltered areas, shells may have up to 12 frills (lamellae). Shell height typically falls between 50 mm and 80 mm. Nucella canaliculata can appear similar to a grey-white frilled dogwinkle. However, N. canaliculata is typically more slender than the frilled dogwinkle, and shell height can only reach about 40 mm. Nucella canaliculata is also not considered common in British Columbia. Other species of Nucella don’t typically grow as large as N. lamellosa, nor do they have frilly lamellae. ​The range of this species extends from the Aleutian Islands south to central California. It typically inhabits rocky shorelines from the low to mid intertidal zones, and is often found in mussel beds. 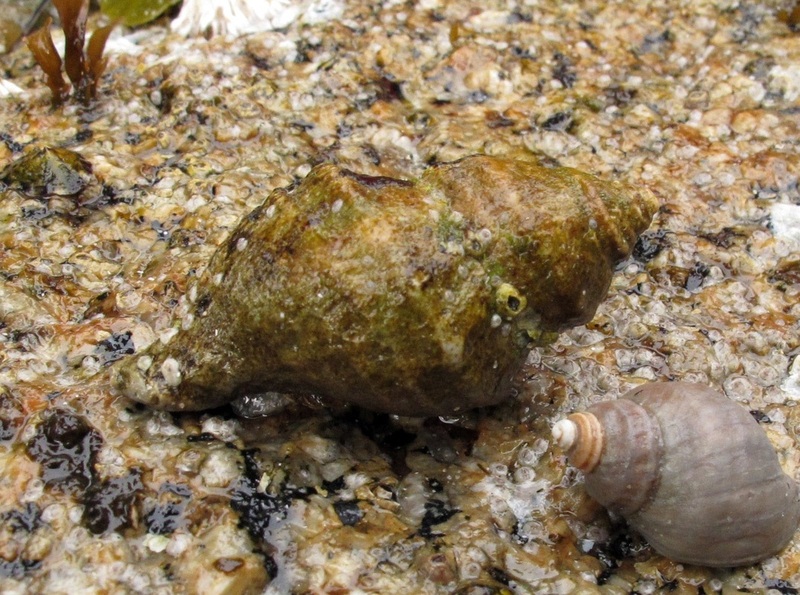 This species is a predatory whelk, and feeds on acorn barnacles (Balanus glandula) and mussels by using its radula to drill through the shell of the prey. This creates a hole through which the whelk inserts a long proboscis to ingest the prey. Shell texture and the presence of frills (lamellae) not only varies with exposure (see above), but also with the presence or absence of their major predator, Cancer productus. In the presence of C. productus, this species have been observed to grow axial frills. A Mediterranean relative of Nucella was used to colour royal Roman robes “Tyrian Purple.” The colour was extracted from the snails by crushing them, and archaeological studies suggest that they would have been collected in a large vat and left to decompose for an unknown period of time (undoubtedly producing a vile odour). The Nucella relatives are not purple themselves, but produce a mucus secretion that functions as an antimicrobial lining on egg cases, and is also used in predatory behaviors. 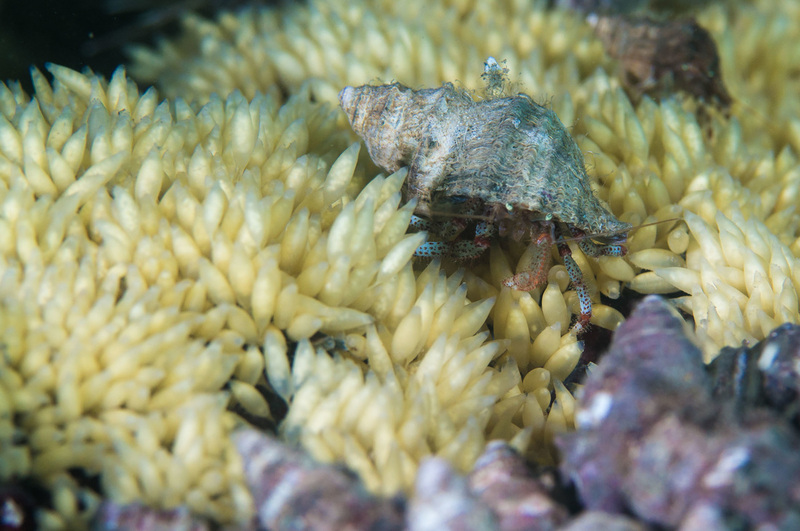 A Bering hermit crab (Pagurus beringanus) occupying a frilled dogwinkle shell, among a mass of the frilled dogwinkle's yellow egg cases known as "sea oats." Photo by Wiebe Nijland. Adams, M. (2005). Nucella lamellosa (Frilled dogwinkle) In Washington State University Extension Island County Beach Watchers. Accessed 2015-11-02. ​Carefoot, T. Nucella lamellosa (Gmelin, 1791) In Klinkenberg, Brian. (Ed.) E-Fauna BC: Electronic Atlas of the Fauna of British Columbia. Lab for Advanced Spatial Analysis, Department of Geography, University of British Columbia, Vancouver. Accessed 2015-11-02. ​Lamb, A., and Hanby, B. (2005). Marine Life of the Pacific Northwest [electronic version]. Madeira Park, BC: Harbour Publishing. Charbonneau, N. (2002). Nucella lamellosa (Gmelin, 1791). Invertebrates of the Salish Sea. Rosario Beach Marine Laboratory. Accessed 2015-10-29. ​Van der Crabbben, J. (2010). Tyrian Purple. Ancient History Encyclopedia. Accessed 2015-11-02.